Originally broadcast in the UK, the ‘Robot Wars’ TV format was subsequently picked up by the Netherlands. ‘Robot Wars: The Dutch battles’ brought together a range of amateur and professional engineers who constructed a variety of imaginative robotic machines designed to overcome or destroy each other. Dutch Robot Wars now continues un-televised as a vibrant community, participating in a calendar of live robot events. Marien van der Meer is a member of Dutch Team FFR and built ‘Gator’, one of two robots, so that his young sons could participate in the games. Unfortunately, the robots had a weakness in that the transmission was frequently damaged as it crashed to the arena floor. It was found that the wheels’ direct connection to the shaft/motor assembly often resulted in broken transmissions; presenting ongoing cost issues for Marien and the team. 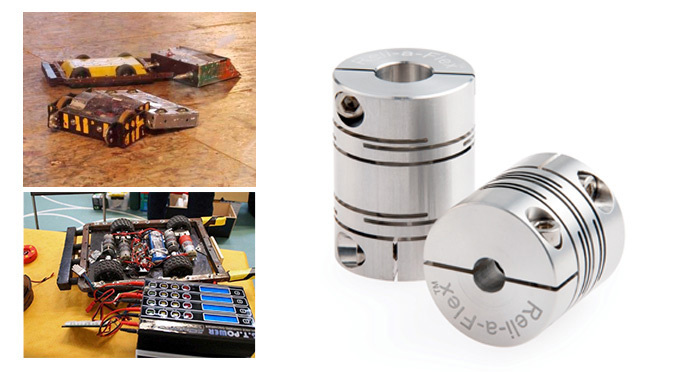 Reli-a-Flex® is a range of one piece precision flexible shaft couplings which are designed to cope with significant angular and parallel misalignment while maintaining highly accurate motion transfer between two rotating shafts. They provide uniform stress levels, combined with accurate angular rotation and a constant pivot length. For more product information, design support and custom solutions, contact Reliance at sales@reliance.co.uk .